Each time a volunteer is a recipient of an email, text, or Vic Mail message from your account, an entry is added to the Messages section of the volunteer’s History tab. This feature tracks custom email and text messages sent by System Operators as well as automatic messages such as schedule reminders and reminders sent for Checklist items. If a message fails to be delivered for some reason, and the recipient’s system generates a reason for the failure, the system records information about why the message failed. By default, the system looks at the last 3 email or text messages sent to determine the volunteer’s email validity and text message validity. You can change this default in your account’s Setup. You can learn more about how messages are tracked on the History tab in help topic 2064. 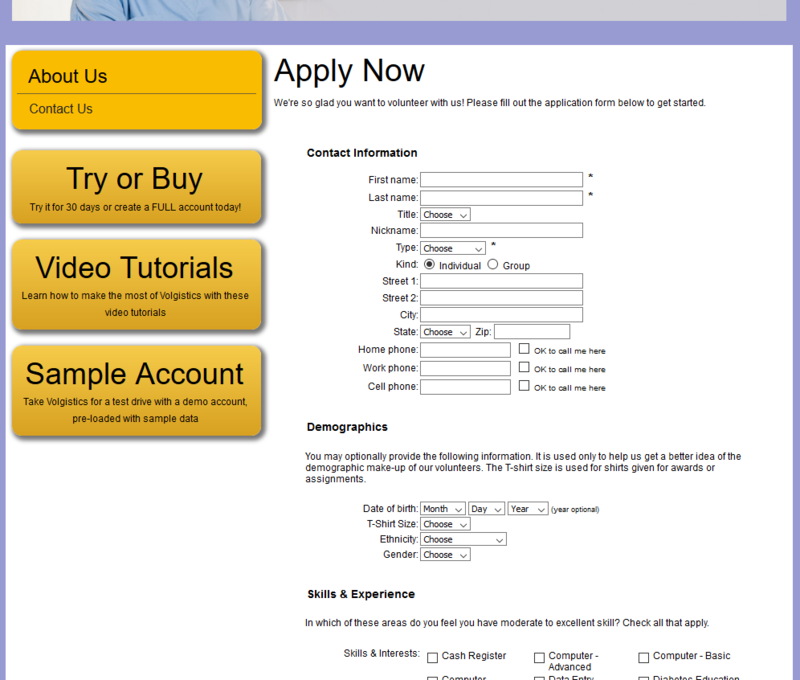 Embedding an application form into one of your webpages makes the form appear as part of your own website. The downside to this approach has always been that the form often includes a scrollbar, or it requires you to manually figure out and set the height in your HTML code. But the height can change if you update the form, or if a submission is missing required information, causing a scrollbar to appear anyway. To avoid these complications, Volgistics has introduced a new feature to automatically set the height for these forms. It requires you to copy and paste a small amount of code to your page, but you’ll never have to adjust the height again. For existing forms, you’ll basically remove the old link and paste in the new code. Remember, if you’re not familiar with editing HTML code, you can just pass the copied code to your IT team or your site’s webmaster. Under the Links heading, you’ll see the new code under Embedded Form. You can copy the code and paste into your webpage, wherever you would like the form to appear. If you’re updating an existing form, just be sure to remove the old iframe code first, otherwise you’ll have two copies on your page. After you’ve added this to your website, let us know what you think! We’re always eager to hear from you about the new features we put out and how they’re helping you to accomplish your mission. 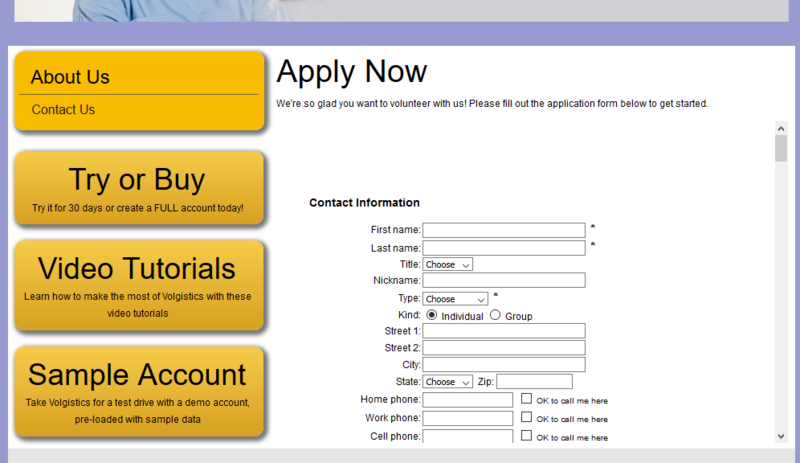 If you use online application forms to receive information from prospective volunteers, you may sometimes need to know when a volunteer submitted their application. There is not a field in Volgistics that tracks this exact date because application information is usually routed to the Applications tab of your Mailbox until you process the application. However, you can review your account’s Event Log if you need to find the exact date an applicant submitted an application. The log will show an Event called “Application Submitted” and the Description column will list the applicant’s name. In many cases, you can speed up the search if you’re looking for a particular name by using the Find feature. You can usually bring this up by holding down the “CTRL” key on your keyboard while pressing the “F” key. Once an application is received into your database, Volgistics tracks the date it was received by using the “Date Entered” field. You can find this field in the Dates box on the History tab of each volunteer record. It is also available on most reports that have volunteer information. Please note, if the record was added to your database in some other way than receiving an application form, the “Date Entered” field will reflect the date the record was created by the other method. Expand the “System operators” link. Select Mailbox from the Menu. Select the “Out Box” tab. Click the subject of the sent message. The names of people the message was sent to will appear under “Recipients”. People who were included on the list to receive the message, but to whom it was not sent, will appear with their names crossed through. A volunteer may not have had the message sent to them if they do not have an email address on file, or if they have an invalid email address, or if they had opted-out the type of message that was sent. There are some circumstances when recipients will not appear in this list. For example, if you’re a Site Level Operator you will not see any recipients. Volunteers will also not be listed here if they have been archived or deleted. Self-scheduling alerts can be setup on the Schedule ‘Rules’ tab of each Assignment record to send notifications whenever a volunteer adds or removes themselves from that Assignment’s Schedule. These notifications can be sent to system operators via the Volgistics Mailbox and/or to coordinators by email or text message. This ensures that staff and supervisors are made aware of any schedule changes that may have occurred to their Assignments’ schedules. However, there may be times when a system operator would prefer to receive these notifications by email or text. This can be arranged by creating a coordinator record for that system operator, giving the coordinator record that operator’s email address, and/or opting the coordinator into text messaging via the ‘Account’ tab of their VicNet access, and then assigning that coordinator to the Assignment record(s) that they’d like to receive notifications for. The operator will then be able to receive self-scheduling notifications that are sent by email or text message to the Assignments’ coordinators. National Volunteer Week is coming up fast and we wanted to make sure you are aware of it. National Volunteer Week was established to inspire people to volunteer to make their communities a better place, to recognize your current volunteers, and to encourage volunteerism in general. The U.S. and Canada will celebrate National Volunteer Week this year from April 7-13, 2019. Australia’s volunteer week is scheduled for 20-26 May 2019 and the United Kingdom’s is scheduled for 1-7 June 2019. Your Volgistics database is divided into archived and non-archived sections. The Archive is designed for long term storage of inactive volunteers. In your account’s service level, archived records cost significantly less because they have more limited functionality than non-archived records. For example, archived volunteers cannot be tagged or scheduled, access VicNet or VicTouch, or receive email or text messages, and will not appear on birthday lists. Another important difference is that archived volunteer information is not available on most reports in Volgistics. Archived records will still be included on Service Summary and Service Details reports, and can optionally be included in Statistics and Excel spreadsheet reports. To print a list of archived record information, the best option is to use a custom Excel Spreadsheet report and include the archived records on the Options tab. You can learn more in Help topic 1997.